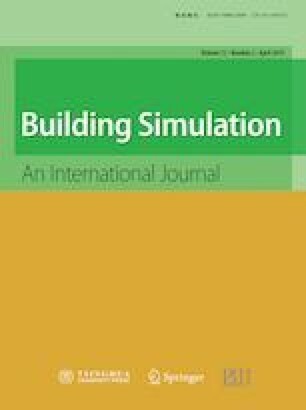 This study conducted the numerical simulation to evaluate the performance of a ductless personalized ventilation (DPV) combined with radiant floor cooling system (RFCS) and displacement ventilation (DV) system. In the non-DPV cases, DV supplies air at temperature of 16 °C and 20 °C, respectively with a flow rate of 2.4 ACH. In the cases with DPV, DPV supplies personalized air, which is drawn at the height of 0.1 m or 0.2 m above the floor, to the face of a seated occupant at flow rates of 3 L/s, 5 L/s and 7 L/s, respectively. The horizontal distance of 0.3 m is designed between DPV air supply opening and occupant face at the height of 1.2m. For all the cases, the floor cooling temperature is set to 20 °C. The vertical air temperature difference at 1.1 m and 0.1 m (ΔT1.1−0.1), the contaminant removal effectiveness (ε) and the draft rate at the occupant face (DRface) are mainly used as evaluation indices to quantify the ventilation effectiveness and thermal comfort effect. According to the results, DPV remarkably decreases ΔT1.1−0.1 with a maximum reduction of 1.79 °C compared to non-DPV case. DPV significantly influences the temperature adjacent to the face at the breathing zone, with a maximum reduction of 4.44 °C from non-DPV case to DPV case. DPV cases also effectively improve ε at breathing region compared to the non-DPV case. The DRface ranges from 9.01% to 21.33% when different flow rates of DPV are used. In summary, the case using DPV flow rate of 5 L/s and at intake height of 0.1 m presented relatively better ventilation effectiveness and thermal comfort environment around the occupant. This study is sponsored by the National Natural Science Foundation of China (No. 51608310, No. 51806126), and the Innovation Team of the Co-Innovation Center for Green Building of Shandong Province in Shandong Jianzhu University. This study is also supported by the project “Robotic Personal Conditioning Device” sponsored by DOE ARPA-E (DE-AR0000530).